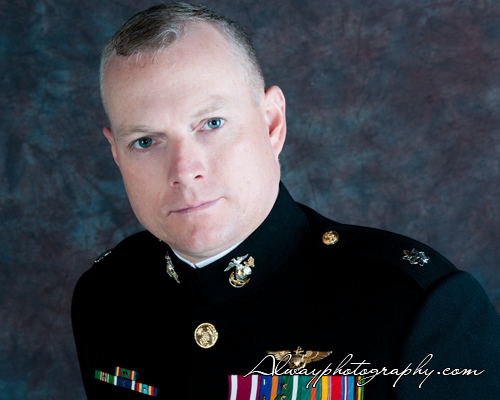 This morning I had the privilege to photograph Lt. Col. Mike Harmon and his wife, Joy. Mike, 42, is a helicopter pilot in the Marine Corps who just completed a one year deployment to Afghanistan. Mike and Joy wanted some portraits of themselves so they stopped into Alway Photography. I couldn’t resist interviewing Mike and Joy for MasonCountyPress.com about life in the Marines. Both Mike and Joy are truly American heroes, putting service to their country before everything else. I’ve known Mike most of my life, pretty much since grade school. We graduated together at Mason County Central and grew up down the road from each other in northern Amber Township. After high school he attended Purdue University on a Reserve Officer Training Corp. (ROTC) scholarship to the Marines. For more of Mike’s story, go to www.masoncountypress.com.